Chris Evans, Hugo Weaving and Hayley Atwell star in the superhero action-adventure Captain America: The First Avenger. Watch the movie trailer below. After being deemed unfit for military service, Steve Rogers volunteers for a top secret research project that turns him into Captain America, a superhero dedicated to defending America’s ideals. Running Time: 2 hrs. 5 min. MPAA Rating: (PG-13) for intense sequences of sci-fi violence and action. Paramount Pictures and Marvel Entertainment present the story of one man destined to become the world’s First Avenger. It is 1941, and the world is being torn apart by war. After repeatedly trying to enlist in the military to do his part and fight alongside his brothers and sisters in the Allied Forces, the young and scrappy 98 pound Steve Rogers (Chris Evans) is accepted to participate in an experimental program that turns him into the Super-Soldier known as Captain America. 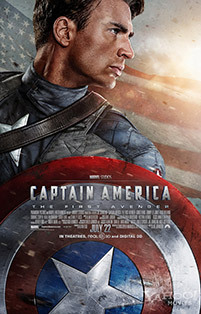 In his muscular new incarnation, Captain America joins forces with his friend Bucky Barnes (Sebastian Stan) and the confident Peggy Carter (Hayley Atwell), under the command of Colonel Chester Phillips (Tommy Lee Jones), to wage war on the evil HYDRA organization—the Nazi’s deep science division—led by the villainous Red Skull (Hugo Weaving). “Captain America: The First Avenger” focuses on the early days of the Marvel Universe—later populated with such super heroes as Iron Man, the Hulk and Thor…When wars were fought with weapons, but won by men.